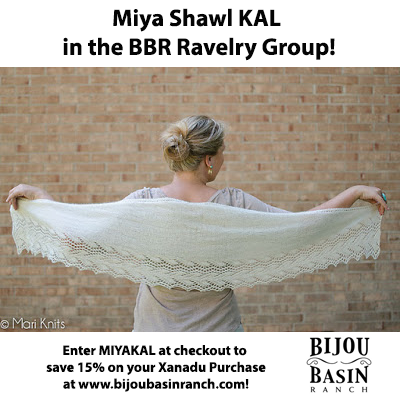 Bijou Basin Ranch: A Giveaway, a KAL & Upcoming Events! A Giveaway, a KAL & Upcoming Events! October is here, and we're celebrating the return of fall with a giveaway, a KAL, and our final three fiber festivals of the year! Now that our 7 new hand-dyed colorways of Lhasa Wilderness are available in our online store, we are excited to share them with the world - and what better way than a yarn giveaway? 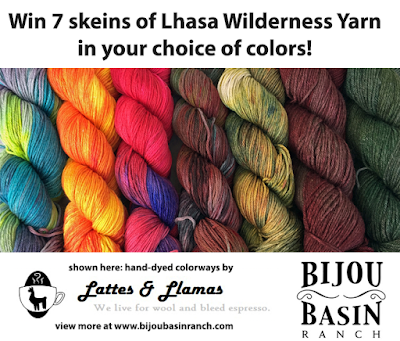 One lucky person will win 7 skeins of Lhasa Wilderness yarn in the color of their choosing - and they can even mix and match our new Lattes & Llamas colorways with our semi-solid Outlandish palette! Click here for full contest details and to enter; we'll be announcing our lucky winner on October 30! Our fall KAL will be starting soon in the Friends of Bijou Basin Ranch Ravelry group! On October 12, we'll be casting on for the Miya Shawl by Mari Chiba, which uses just one skein of our luxurious new 100% cashmere yarn, Xanadu. Bloggers Knitting Sarah and Handmade by Stefanie will be leading the way with their Miya shawl projects, and we invite you to join in the fun! Now through November 15, 2015, save 15% on your purchase of Xanadu yarn when you enter MIYAKAL at checkout. You will automatically receive the Miya shawl pattern FREE with yarn purchase for the KAL! To participate, post your progress and finished shawl projects (using Xanadu yarn, of course) here in our Ravelry Group. We'd also love to see your progress on Instagram or your social media channel of choice - just tag your photos with #bijoubasinranch and #miyaKAL! $20 gift certificate to bijoubasinranch.com. 2 Allure Fiber Wash sampler packs. We'll announce our three lucky winners in our Ravelry group after the close of the KAL on November 30. Last but not least, we have some exciting fiber shows coming up! This weekend, you can find us at the Taos Wool Festival. 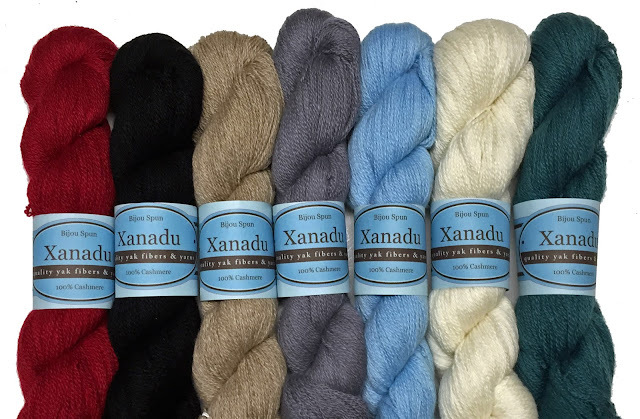 Look for our new Lattes & Llamas colorways, Xanadu yarn, and all of your favorite luxury yarns in the Bijou Basin Ranch booth - and don't forget the Allure wash! Later this month, we'll be heading to the New York State Sheep & Wool Festival (better known as Rhinebeck) in upstate New York, followed by the Southeastern Animal Fiber Fair in Fletcher, NC. Click here for more details on our site - we hope to see you there!